CarGurus has 137 nationwide Mirai listings starting at $14,995. It’s unclear whether hydrogen fuel-cell vehicles (FCVs) are the way of the future as far as personal transport is concerned, but both Honda and Toyota have invested serious resources into this technology—in part thanks to Japanese government subsidies and in conjunction with hydrogen-fueling infrastructure in California. Honda paved the way back in 2009 with the now-discontinued FCX Clarity, but Toyota has been toying with the technology for years as well and introduced its own FCV, the Mirai, in 2016. Unveiled at the 2014 L.A. Auto Show, the Mirai is also available for sale in the U.K., Denmark, Germany, Belgium, and Norway. The Mirai’s distinctive styling advertises its unconventionality, and though some might call it ugly, it doesn’t look totally outlandish. Its base price is almost $60,000, though Toyota claims most people will lease the Mirai. Production is fairly small scale given the limited target audience and refueling infrastructure, and Toyota plans to make only a few hundred Mirais per year. The most interesting thing about the Mirai and other FCVs is, of course, their power source. FCVs react hydrogen fuel with oxygen to power their electric motors that then power the wheels, emitting water as a byproduct. 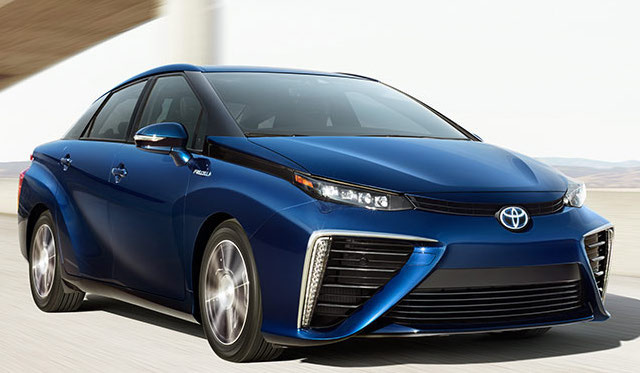 In the Mirai, the fuel cell under the front seats makes the equivalent of 153 hp, which is sent to the electric motors that drive the front wheels. A 1.6-kWh nickel-metal-hydride battery pack provides additional short boosts of energy. While the Mirai can reach 60 mph in about 9 seconds, it doesn’t have much more to give. The car weighs over two tons, and 153 hp just isn’t a lot of grunt for that much weight. The Mirai has a range of 312 miles on a full tank, but because hydrogen refueling stations are currently limited to certain parts of California, the Mirai will be a commuter vehicle for most buyers. Road trips just aren’t an option. As for handling, the Mirai is no go-kart—it has a rather numb steering feel even by commuter-sedan standards. While the interior of the Mirai is deliberately futuristic with its 3 dashboard display screens, it’s clear that you are paying mainly for the powertrain underneath. 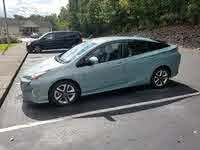 It has the comfort, convenience features, and materials of a significantly cheaper car. The Mirai can carry only 4 passengers, and the hydrogen tanks located between the rear wheels and below the rear seat reduce available trunk space significantly. It does, however, feature a DC-to-AC inverter that can power your house, and since the car emits only water, it can run in a closed garage. With its low production numbers and high price tag, the Mirai won’t be crash-tested anytime soon. But normal consumer concerns like safety aren’t as relevant for a car like this, since it’s primarily for early adopters who want to experience new and futuristic technology. The novelty factor is really the only appeal of the 2017 Mirai, as there are plenty of cars that are objectively better and cost much less. And unlike electric vehicles and plug-in hybrids, FCVs are almost completely dependent on hydrogen-refueling infrastructure, which is currently fairly isolated and not expanding very quickly. For Toyota, this car is both a PR exercise and an experiment into alternative sources of energy for personal transport. We look forward to seeing whether manufacturers decide to pursue fuel-cell technology further. What's your take on the 2017 Toyota Mirai? Have you driven a 2017 Toyota Mirai?